A happy 2012 to three gentlemen tied together by two American staples: pop music and baseball. Dave Frishberg (b. 1933) wrote his bossa nova tune "Van Lingle Mungo" after enjoying the musical sound of golden era player names while piano noodling. As his song profile notes, former Dodger hurler Mungo hoped for some income based on the song, but learned he'd have to write his own to do so. Two players mentioned in Frishberg's tune are still with us! 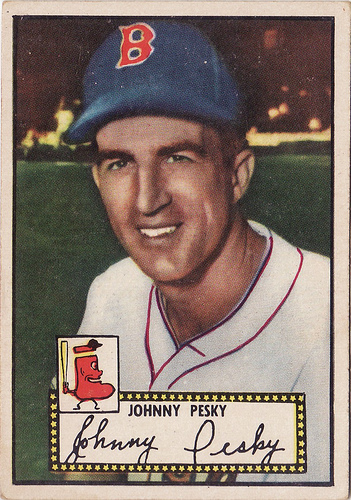 Boston fan favorite Johnny Pesky (1919-2012) played for teams other than the Red Sox, but he's been inseparable from the franchise since 1968, serving as instructor, coach, and namesake of Fenway's right-field foul pole. UPDATE: Sad to say, Johnny "The Needle" Pesky passed away on August 13, 2012. What a life he lived in (and for) baseball! 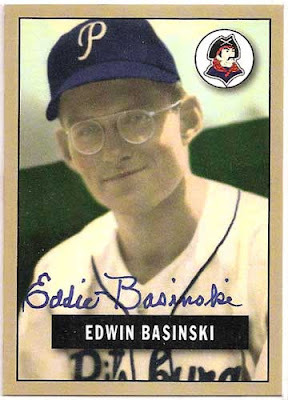 WWII-era player Eddie Basinski (b. 1922) spent only a few years in the majors, but spun his war time opportunity into two MLB stints, first with the Brooklyn Dodgers and later with Pittsburgh. Eddie jumped right from the semipro sandlots to the bigs, an almost unheard-of feat detailed further in Slangon's write-up for his autograph (and custom card) of Mr. Basinski. Today is also the birthday of another player mentioned in the song, Frenchy Bordagaray. I like how Frenchy's obit claims he "staged a one-man mustache revival in the major leagues" for the 1930s Dodgers. We should all be so memorable!